CHONGQING, China—February 8, 2017—Daqo New Energy Corp. (NYSE: DQ) ("Daqo New Energy", the "Company" or “we”), a leading manufacturer of high-purity polysilicon for the global solar PV industry, today announced that it has commenced initial production at the Phase 3A polysilicon facility located on its Xinjiang polysilicon manufacturing site. All the construction and installation work related to Phase 3A was completed by the end of 2016. With the new Phase 3A facility having started initial production, the Company expects to reach a full production run rate of 18,000 MT per annum at its Xinjiang polysilicon facilities by the end of the first quarter of 2017. "We are very excited to have successfully completed the Phase 3A project and commenced initial production at this new facility ahead of schedule. We expect to reach full production throughput by the end of the first quarter of 2017, months ahead of our original schedule. In addition, we have achieved the highest capital expenditure efficiency in the Company's history of polysilicon capacity expansion by reutilizing idle machinery and equipment in Chongqing and leveraging existing shared facilities in Xinjiang," commented Dr. Gongda Yao, Chief Executive Officer of Daqo New Energy. "In addition, with technology upgrades, equipment addition, and process improvement, we anticipate we will achieve further cost reduction and quality improvement, which will help us better serve customer demand, especially from the high-end markets such as high-efficiency mono crystalline wafer." This announcement contains forward-looking statements. These statements are made under the "safe harbor" provisions of the U.S. Private Securities Litigation Reform Act of 1995. These forward-looking statements can be identified by terminology such as "will," "expects," "anticipates," "future," "intends," "plans," "believes," "estimates," and similar statements. Among other things, the quotations from management in this announcement, as well as Daqo New Energy's strategic and operational plans, contain forward-looking statements. The Company may also make written or oral forward-looking statements in its reports filed with or furnished to the U.S. Securities and Exchange Commission, in its annual reports to shareholders, in press releases and other written materials and in oral statements made by its officers, directors or employees to third parties. Statements that are not historical facts, including statements about the Company's beliefs and expectations, are forward-looking statements. Forward-looking statements involve inherent risks and uncertainties. A number of factors could cause actual results to differ materially from those contained in any forward-looking statement, including but not limited to the following: the demand for photovoltaic products and the development of photovoltaic technologies; global supply and demand for polysilicon; alternative technologies in cell manufacturing; the Company's ability to significantly expand its polysilicon production capacity and output; the reduction in or elimination of government subsidies and economic incentives for solar energy applications; and the Company's ability to lower its production costs. Further information regarding these and other risks is included in the reports or documents the Company has filed with, or furnished to, the Securities and Exchange Commission. Daqo New Energy does not undertake any obligation to update any forward-looking statement, except as required under applicable law. 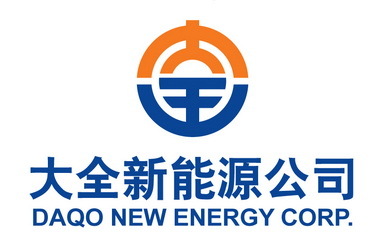 All information provided in this press release is as of the date of this press release, and Daqo New Energy undertakes no duty to update such information, except as required under applicable law.